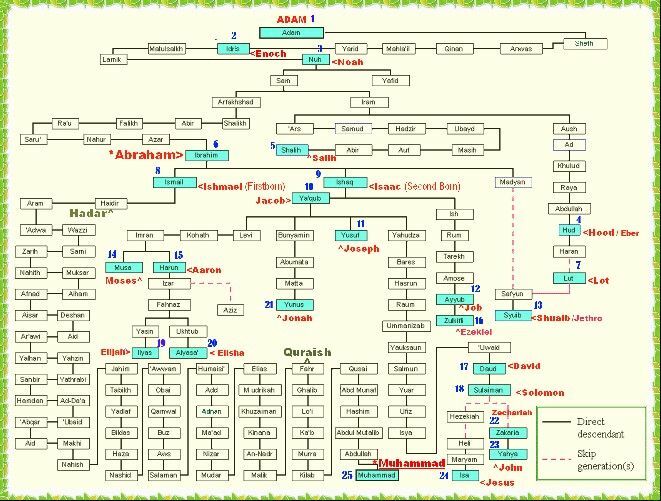 Use the hints to fill in the names of the 25 prophets mentioned by name in the Quran. This prophet was raised to 'a high place' after his death. The first messenger. Built the ark. Sent to the people of Aad, who built Iram of the Pillars. Sent to the people of Thamud. His miracle was the She-Camel. Nicknamed 'Father of the Prophets'. First born of #6, and ancestor of the Arabs. Also known as Israel. Ancestor of the Hebrews. Youngest son of the above. Was imprisoned before becoming Treasurer of Egypt. Sent to the people of Madyan in northern Arabia. Liberated the sons of Israel from the treachery of Pharaoh. The above's brother and right-hand man. Got swallowed by a giant fish, and lived. God took away his wealth and health to test him, and he was patient. One of the Hebrews' many prophets. His name means "possessor of the cloth." Mentioned only twice in the Quran. Some scholars claim he is descended from #14. Prophetic successor of the above. Also mentioned twice in the Quran. Killed the giant Jalut (Goliath) using only a sling. Later became king of Israel. Heir of the above. He could talk to animals, commanded the wind, and had an army of Djinn. He was a steadfast Jewish priest and guardian of Mary, the mother of #24. Son of the above. He was given wisdom and prophethood as a youth. The Messiah. According to the Quran, he was not crucified but raised to heaven. The last prophet and messenger. The Quran was revealed to him. Nice quiz. I got 11/25. 14/25 here! Fun quiz! I like that you accept the translated names also. Good Job!